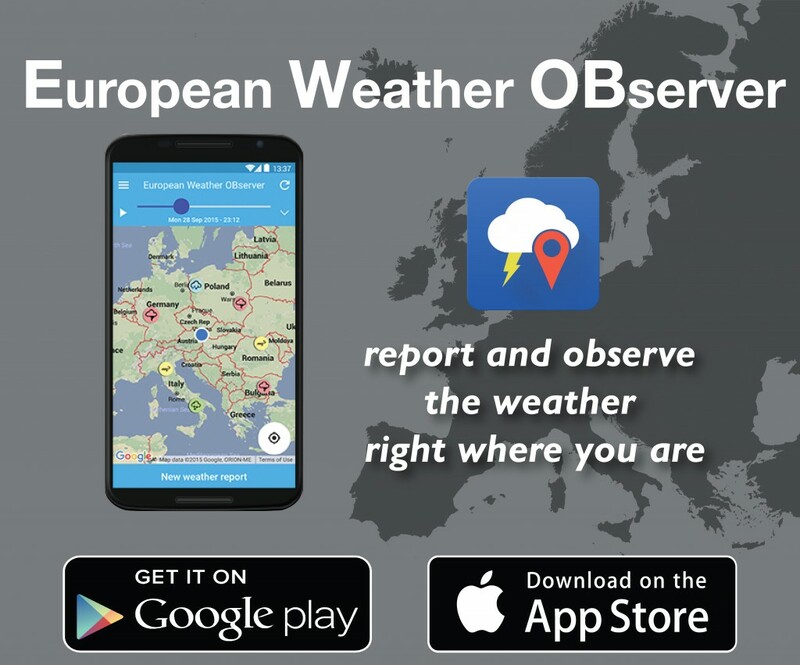 Help us promote the European Weather OBserver (EWOB) app to the severe weather community, to your colleagues, friends and family! EWOB helps meteorologists to issue better weather warnings. You can contribute with YOUR report. It takes just a few seconds. Today there is some potential for severe weather. By reporting your weather to EWOB you can greatly support the meteorologists on duty to issue appropriate warnings. The weather does not behave like it was forecast? Report it to EWOB, so that meteorologists can see it. You will help scientists in research to better understand such weather situations, but your report can also improve warnings in the short-term. You believe that the current weather could be dangerous for others in your region? Please, report it to EWOB. Dense fog at your place? How dense is it? Please report it to EWOB, so that others can benefit from your knowledge and information. The weather forecast calls for rain, but it is snowing – or vice versa? Please report it to EWOB. The form of precipitation sometimes cannot be determined from weather radar or weather station readings. Your report can be a crucial piece of information for meteorologists. Is there freezing rain in your area? Please report it to EWOB, this can be an important information for warning meteorologists and also for researchers who like to improve the use of weather radar and weather models. Do you see storm damage? Please report it to EWOB. This an important piece of information for severe storm researchers and also for warning meteorologists. There is flooding at your place? Please report it to EWOB. This is an important information to improve warnings. Do you know firefighters or policemen? Tell them about EWOB. It would be great if they could contribute. And EWOB can also help them by seeing severe weather approach. EWOB is a community effort run by the non-profit research organization ESSL. We ensure that your reports will best be made available to all who need it for public safety and severe weather research, and not only for a single enterprise. Please contact us if your organization needs direct EWOB data access. This poster and the above messages are also available as a PDF file for download.